Robert Venturi photographed by Denise Scott Brown, 1968. 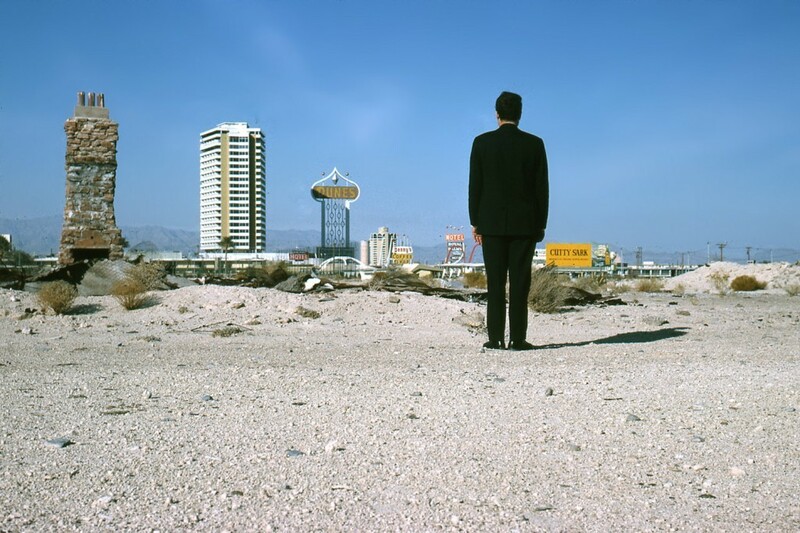 Photo: Venturi Scott Brown and Associates, Inc.
AS AN ARCHITECTURE STUDENT STRAPPED FOR CASH in the mid 1970s, I managed to burn a month’s rent on a first-edition copy of Learning from Las Vegas by Robert Venturi and his life partner, Denise Scott Brown. This book was a revelation. I learned that architectural production could take the form of a research project and book, not only bricks and mortar. The authors single-handedly inverted the prevailing logic of design pedagogy by asserting that the rarefied world of academia could gain valuable insights from pop culture. At the time, I was studying at Cooper Union under the spell of the “Whites,” a faction of purists who preached about authenticity and the autonomy of the discipline, freed from the soulless and intellectually bankrupt profession. In sharp contrast, Venturi and Scott Brown, the pagan leaders of the “Grays,” celebrated the banality of everyday architecture, contamination, and the superficial. Any reference to these adversaries was taboo in my school, but I stashed a copy of Venturi’s seminal 1966 book, Complexity and Contradiction in Architecture, under my desk, sneaking short reads in secret. That compact 135-page paperback liberated mealong with an entire generation of architectsfrom the suffocating orthodoxies of modernist doctrine. It became the bedrock of my education. In the decades to follow, I watched from afar as Venturi and Scott Brown continued their critique of the notoriously sober architectural establishment through their unique form of productive irony. While they unwittingly unleashed a following of historicists that brought kitsch to the wealthy and elite, Venturi and Scott Brown were dedicated to a mannered breed of modernism that was contextually aware and socially relevant. They were a model for what a critical architectural practice could be, engaging teaching, theoretical writing, urban planning, and architectural design. As is the fate of most radical ideas, Venturi and Scott Brown’s disruptive work got filtered into the mainstream over time. Unfortunately, so much so that my first edition of Learning from Las Vegasthe one I once prized as a studentdisappeared from my studio’s library many years later, perhaps auctioned on eBay to pay off someone’s much steeper rent. But while Venturi and Scott Brown’s provocations became accepted wisdom, their most earnest followers understood that their lessons were a call to action, not complacency. Their famous dictum, “Main Street is almost all right,” left a space for the interpretive role of architecture in the American commercial vernacular. While the duo’s reflections cannot easily scale up to the unwieldy urban growth and spectacle of today’s global consumer culture, they continue to challenge architects to confront, rather than withdraw from, the complexities and contradictions of everyday life. In September we lost one half of this vital partnership. As it is difficult to untangle the work of Robert Venturi from that of Scott Brown, I offer a tribute to the work itself. Elizabeth Diller is a founding partner of Diller Scofidio + Renfro (DS+R), an interdisciplinary design studio based in New York.